This document has been drawn so as to help protect your business, provide an administrative framework for your arrangements with agents. Use it for a deal with a single agent or a corporate organisation; for selling to gift shops or the Department of National Defence. This document is suitable for any person setting up one or more commission agents to sell goods inside or outside Canada . 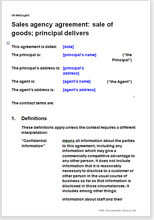 This document covers the usual agency situation where the agent has responsibility for selling the goods, marketing as you direct and maintaining customer goodwill. You can use this agreement either as the basis for individual discussion or to treat it as your standard agent’s terms and serve it up to new agents with no options for change. Either way you will have a comprehensive agreement, drawn to be practical and useful. Like all Net Lawman documents, it is intended to be practical and useful as well as giving legal protection. You can state how the goods can be sold, how customers can be managed, what information you require and much more. This and its equivalent to sell services, cover the simplest arrangements in a set of practical and thorough agency and distribution agreements. They cover many different arrangements for third party marketing. You can look over any of them from Sales agency agreements.